Bringing the arts (especially laughter and entertainment) to students brings them together in a shared experience, creates camaraderie, and reduces stress, while helping them become more well-rounded. Brad Zupp started performing professionally at age 12 and continued for 20 years, performing around the world at corporate events, schools, and shopping malls, on cruise ships, at theme parks, and with Ringling Brothers and Barnum & Bailey Circus. At 32 he settled down into a life of real estate and finance. At age 40, after several years as a financial planner, he realized that both adults and children lacked understanding of essential financial concepts. He decided to combine his love of making people laugh with his knowledge of personal finance and FUNance was created. 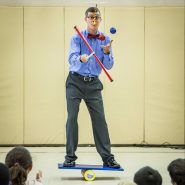 His goal is to entertain students while showing them the importance of math in everyday life and the essentials of personal finance. 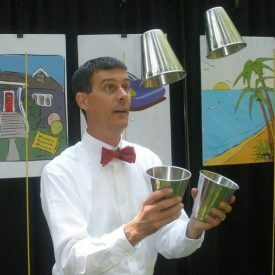 After nine years and hundreds of performances, he knows that thousands of students have a better understanding of money because of the time they’ve spent laughing and enjoying the FUNance assemblies. Too many laughs to count! My favorite feedback was hearing from parents how their kids came home and talked about spending vs. saving and needs vs. wants. The parents hadn't seen the show but their children understood the lessons well enough to explain them at home. FUNance: Where Fun and Finance Collide!